Mumbai: Beleaguered Kingfisher Airlines Ltd plans to ask lessors to return cash worth $170 million kept as deposits with them in return for bank guarantees, as it fights to stay afloat in a slowing economy. Nedungadi said the airline has also sought help from banks on working capital requirements to account for changes in the international prices of fuel and the fall of the rupee against the dollar. The cash-strapped carrier, India’s second largest airline by passengers carried, cancelled 50 flights on Tuesday, more than the 31 it had decided to ground every day for 12 days, Mint reported on 9 November. The share price of the firm dropped 9% on Wednesday to close at ₹ 21.70, which an analyst said was largely because of the flight cancellations and in anticipation of poor September quarter earnings expected next week. “The stock has been hammered primarily due to cancellation of flights, including metro routes, that were making money. This would mean the airline is running out of cash to operate flights," the analyst with a domestic brokerage said. He spoke on condition that neither he nor his firm be named. Kingfisher Airlines had said in September it is exiting the low-fare segment, which operates under the Kingfisher Red brand. “The decision to exit the low-fare segment will yield results gradually," a company executive said, requesting anonymity. A group of 13 lenders, including State Bank of India and ICICI Bank Ltd, bought a 23.21% stake in Kingfisher Airlines in April this year. SBI picked up a 5.67% stake and ICICI Bank 5.3%. The airline converted ₹ 750 crore of its total debt of ₹ 7,000 crore into equity at a 61.6% premium over its share price in what many considered a sweetheart deal. It allotted shares to lenders on 31 March at ₹ 64.48 apiece. A.P. Verma, chief credit and risk officer at SBI, the country’s largest lender, in a separate and unrelated press conference on Wednesday said his bank has stopped lending to airlines. He did not divulge details on Kingfisher Airlines. SBI chairman Pratip Chaudhuri did not reply to calls or messages seeking comments on the situation at the passenger carrier. To cut costs and increase efficiency, the airline will have eight first class seats and 156 economy seats in all of its Airbus aircraft, thereby increasing capacity by 10%, said the executive cited earlier. “We are trimming employee headcount and have initiated cost cutting measures," he said, without elaborating. 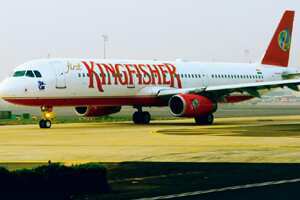 The official also indicated that Kingfisher Airlines may look at boosting its brand as a full-service carrier. “The cost of distribution, operations, infrastructure and the mindset are of a full-service carrier, so why pretend (to be something else)?"